Right, Friday night's offering - including a comprehensive win for England's women against their Scotland counterparts - has set us up for a glorious weekend of rugby, which you can follow across all BBC platforms. Scotland versus England's Calcutta Cup game is the highlight in the Six Nations, while there is also France v Italy and three Premiership games. So get yourself some sleep and we'll see you back here tomorrow? 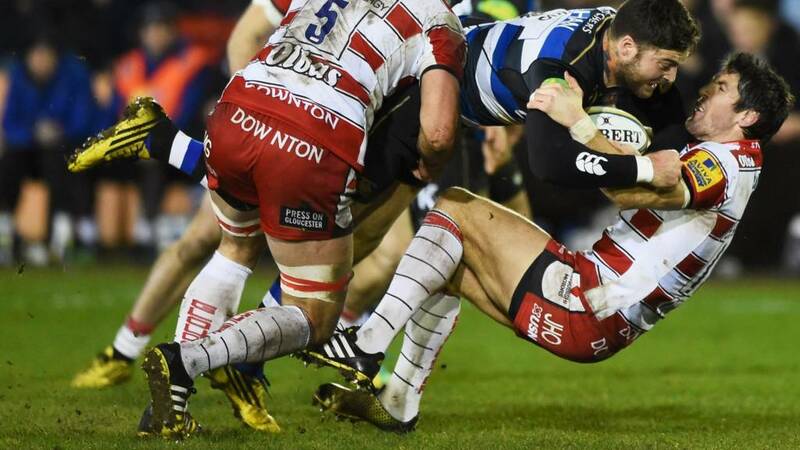 James Hook kicked all 15 points as Gloucester came from behind to beat Bath and inflict a six successive loss on their West Country rivals. Click here to read Brendon Mitchell's full report. Gloucester's game management in that second half was exemplary. Whether Willi Heinz grew up with that kind of atrocious weather in New Zealand I don't know but he played as if it was the norm. Port Talbot-lad James Hook definitely didn't have weather like that in beautiful Perpignan (sigh...), but he too adapted to the conditions. The sportsmanship shown by the respective guards of honour at The Rec is admirable after a tough encounter. Gloucester chip their way into the top six, leapfrogging Wasps who play Newcastle tomorrow. Bath are ninth. Last year's Premiership finalists no less. Ninth. Gloucester end Bath's five-game derby winning run with a thunderous performance in the second half. James Hook's boot did the damage, edging the visitors in front against a Bath side whose effort in desperation just wasn't enough. Full credit to the Cherry and Whites, who looked destined for a crushing in the first 20 minutes. For Mike Ford and Bath, the headaches continue. What can they do to arrest this slump? That's six losses in all competitions in succession now. The drive continues. Then brought down. Bath still have possession close to the line. But Francois Louw is penalised, held on too long. Bath get a penalty. Matt Banahan slings it quickly into touch. Last roll of the dice. Bath fail to execute. Throw not straight and the chink of light is swiftly restored to darkness. Time is running out. Gloucester can sense the win now as they snaffle line-out ball and move it through the backline. Horacio Agulla has it back for Bath though. Minute to go. Gloucester get the feed midway in the Bath half but the penalty goes against them. Bath fired up now, they find touch and move into the Gloucester half. Bath having to force the issue and in turn force an error. Matt Banahan spills from a simple kick forward, groans emit from the stands. Gloucester will take their time with this. Gloucester are penalised when Billy Twelvetrees fails to release midway inside the Bath half. The penalty is cheered like a try. Five to go. Bath try to maul their way forward. Gloucester, comforted by a four-point buffer, are able to just bash Bath back with clearance kicks. The home side know they need to run this ball but they have no field position and the wind is hampering their chance to gain it from the boot of Dan Bowden. Maultime by Bath. Then a chip by Chris Cook which Willi Heinz just gathers and whacks away down field. Kick tennis, aerial pingpong - whatever you want to call it ensues. After a string of Gloucester penalties, Bath players and fans cheer a chance to kick for touch as the visitors are pinged. Bath find touch. They want a second try. What has happened to Bath since last season? Sure, Kyle Eastmond has limped off and they're without a few players on international duty but there are still some world-class members of that squad. Meanwhile, Hook's Welsh compatriot Richard Hibbard is led away from the field with blood streaming from his face. Ouch. Bath are pinged for lifting the leg at the ruck but James Hook is unable to bisect the posts from a tightish angle. No problem close to the sticks. Gloucester's advantage creeps up once more. Gloucester get the penalty! Right in front of the posts. Real pressure, Heinz had picked a gap in the line and Bath were always scrambling. Hook is going to kick.